I love Alexandria – there is no doubt about it. Our stay in the city is truly memorable. This is one place my family will keep on coming back. 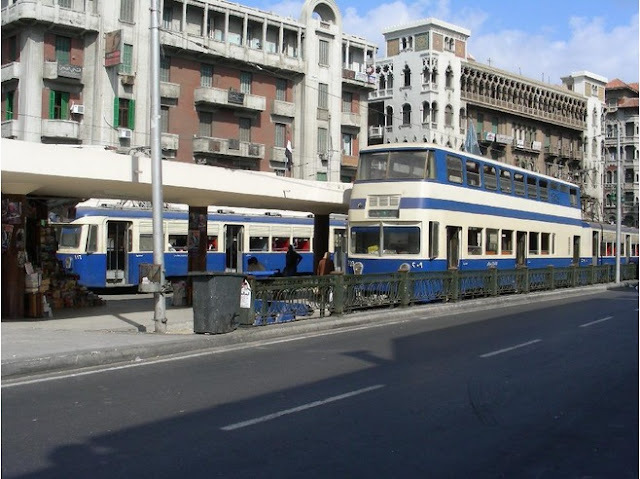 Alex (that is how my local friends call the city) is a modern and the second largest city in Egypt. History tells us that it was founded by Alexander the Great in 331 B.C. and was the setting for the stormy relationship of Cleopatra and Mark Antony. I like travelling by train that is why I visited Alexandria from Cairo. The distance between the two cities is 225 kilometres. I spent almost three hours on the train but not bored while I enjoy the scenery along the way. Seats are comfortable and inside the train is spacious especially for the first class passengers. My trip was made possible with the help of my host Karim whom a I met in a traveller's website with million members few months back. He came to the main train station to pick us up. As soon as I get off I saw him carrying a placard with my name. I was very impressed especially when he told me that he will show us around the whole day and the rest of the night. We went straight to Stanley Bridge in Corniche and spent an hour admiring the towers that highlighted its physical beauty. The artistic design and fine craftsmanship of the tower made it an extravagant feature that adds to the beautiful view of the harbour of the Mediterranean Sea. 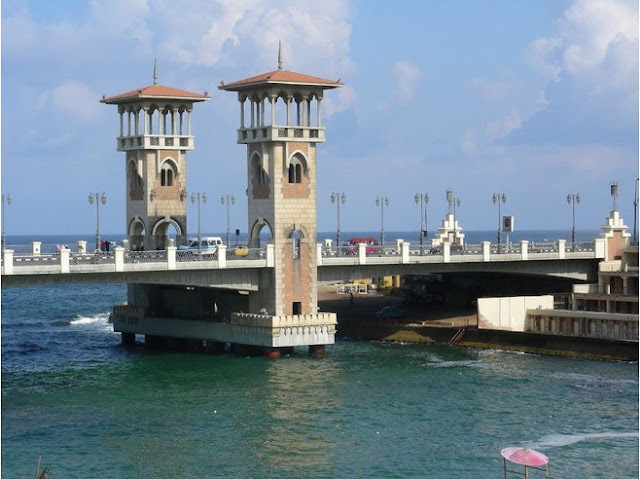 The Mediterranean is what made Alexandria famous. It is awesome! You will be amazed sitting and watching on the shore. The refreshing air gave us a very good impression of the city. 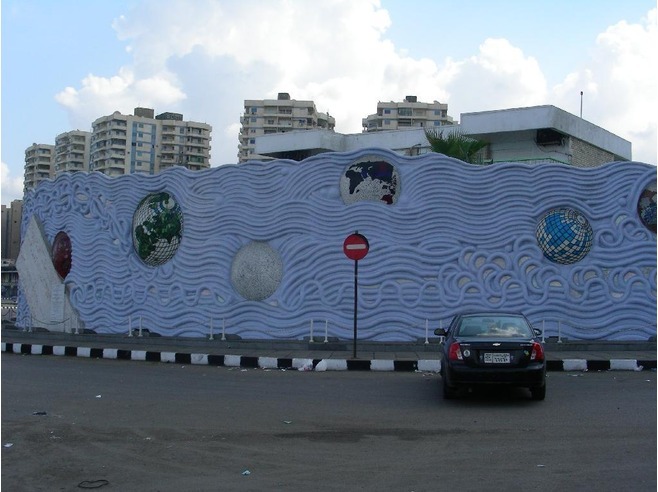 Along the Corniche is a long line of extraordinary high walls carved with coloured art, or shall I say murals.? These were so detailed that the creator of this kind of works must have an inspiration. Just a piece of advice while wandering around Stanley bridge. I do not think you dare drive in Alexandria. Although it is not as worse as Cairo, but still the rules on the road is not followed. I am writing this warning not to offend anyone but to give an idea especially to tourist, not to cross the street in Corniche Road. I came in the morning at around half past nine and only few cars passed by. During rush hour, you will have no guts to try jaywalk on this street. The number of cars is approximately ten times the number in the morning. I admire my host, he is an excellent driver, he is from Alexandria. If you are not from this place, do not drive and do not cross the street - use the underground path. We pass along Bibliotheca, a library which was inaugurated in the year 2002 which I learned became a special event as it was attended by dignitaries from around the world. It is located on the east side of the Corniche and the former site of the old library. It is more than a library -- so they say! 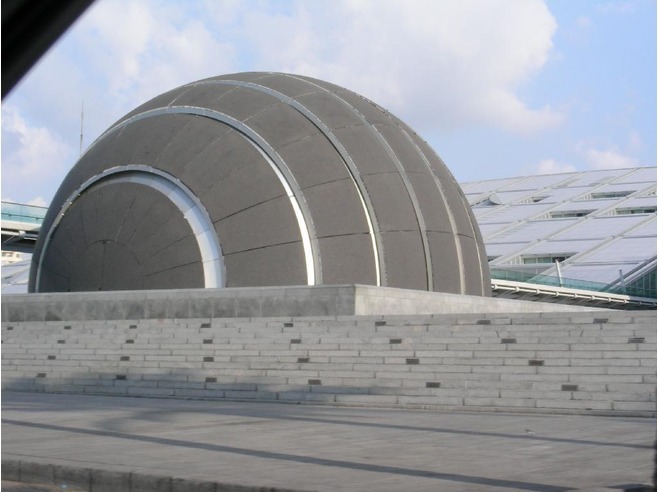 It has museums, a planetarium, research centres, art galleries, and conference centres. If you are using public transport, you make take a tram and ask the driver to drop you in Shatby tram station. 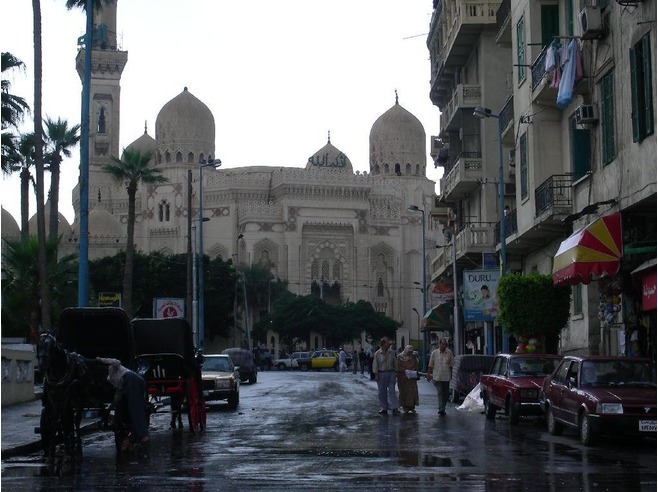 We pass along the Abu el-Abbas el-Mursi Mosque. Very historic and beautiful. This Andalusian-style mosque is the largest in the city situated in Al-Anfushi on Mosque Square overlooking the eastern harbour. It has four domes and a very tall minaret. Women cannot visit the mosque itself but can visit the mausoleum and view the interior of the mosque from behind a barrier. 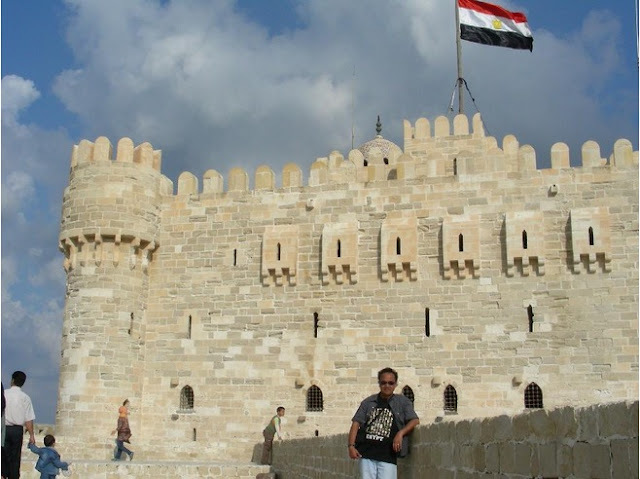 Then we headed to the Qaitbay Citadel at the entrance of the eastern harbour on the eastern point of Pharos Island. It is on the site of the ancient lighthouse that was destroyed by earthquakes in the 14th century. It is nice to watch the people of all ages, locals and tourists alike are frequenting and admiring the beauty of this wonder. Very interesting! We are now on our way to discovering the Fort of Qaitbay. We went around and I must tell you that the view is fascinating. Local people are lined up on the streets selling their wares which are purely local. Walking is fun in Alexandria. Oh yes, I have seen people; the local young boys and girls, some of whom have their parents with them. They are very friendly and comfortable talking to us. I can also say that Alexandria has many colours. From the dresses that the Egyptian women wear and so with the flowers surrounding the mosque near the fort of Qaitbay. Alexandria is the primary port of Egypt. 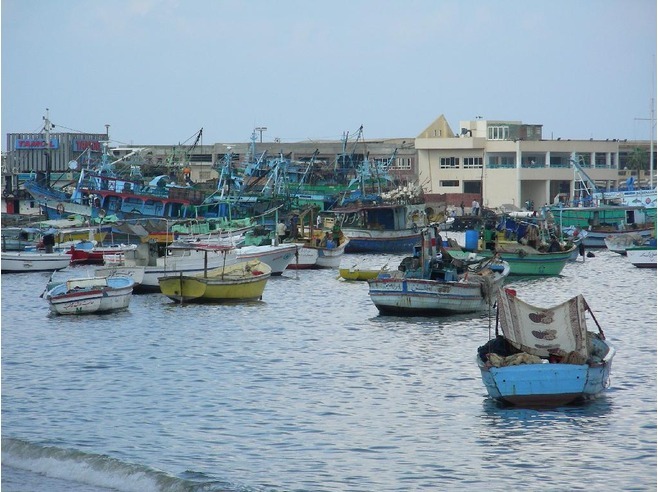 There is a place in Alexandria for small boats to dock at the seashore. Most of the small boats are used for fishing and some are used in transporting passengers on short distances. Then I feel in a hurry to go to the famous Al-Montazah Palace and Gardens. Along the way to the gardens, a clowder of stray cats catches my attention. When I started taking their pictures, each of them started moving as if they like what I am doing. The Al-Montazah Palace (meaning ‘Park’ in the English language) was built on a high hill overlooking the most beautiful beach of Alexandria, surrounded by garden of exotic flowers and palm trees. 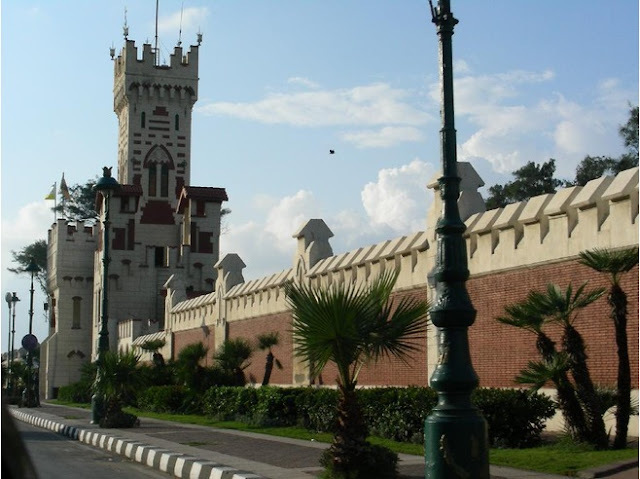 President Anwar El-Sadat renovated the original Salamlek Palace as an official presidential residence which was used most recently by former president Hosni Mubarak. To avoid the heavy traffic and the hustle bustle of the city, the park is the best place to relax and unwind. We did not miss visiting the amphitheatre. It is worth spending at least an hour or so – wondering how people of ancient times built this amazing work of art. 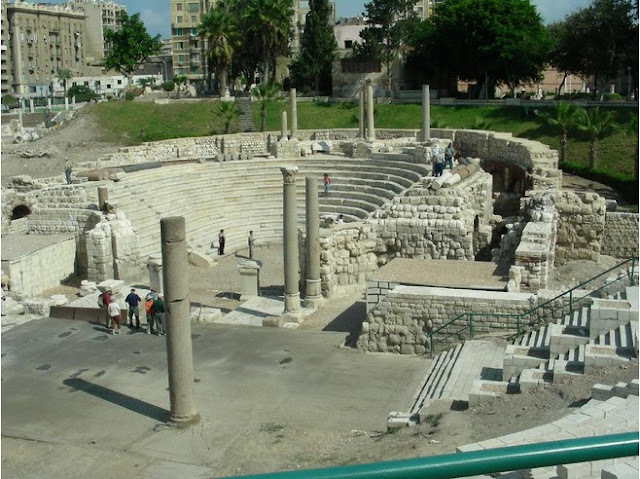 At the Roman amphitheatre, you will see galleries, mosaic floors and marble seats with a capacity of around 800 spectators. You can imagine how artistic the ancient people are when you see every part of the theatre. The amphitheatre is in a general area called Kom El-Dikka, which has become the city’s largest archaeological park not far from the main train station. Close by is the Pompey’s Pillar which is a Roman triumphal column located in ancient acropolis – a hill adjacent to the city’s arab cemetery. Beneath the acropolis are the remains of the Serapeum and going farther are the catacombs, large spiral staircase, statues, burial niches, and other Romano-Egyptian religious symbols. These monuments are within the Greco-Roman Style Square in Mostafa Kamel where you can find more ruins spread all over. To have a break of the antiquities, we headed to one of the biggest shopping mall which is a short drive from the heart of Alexandria. The Alexandria City Centre Mall is so huge that you can buy almost all types of products like designer bags, fashion clothes, stylish shoes, accessories, appliances, and various international brands to name a few. The main anchor store here is the Carrefour, a well known French supermarket. 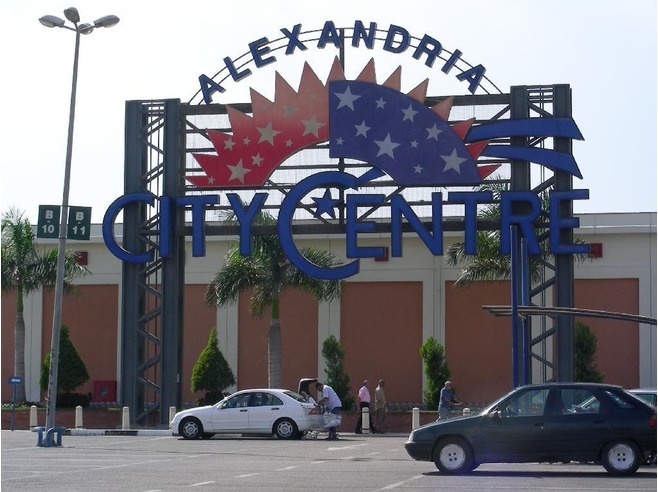 The Alexandria City Centre Mall also offers sophisticated and contemporary shopping and entertainment complemented by a Magic Planet, a six-screen cinema and a variety of dining establishments. Shopping at the Alexandria City Centre Mall is convenient and entertaining. Come and enjoy the ambiance. Have a sit in the Starbucks Coffee or the Costa Coffee within the mall. Take your pick. Enjoy the aroma if you happen to be in Egypt. Afterall, these coffee shops are the leading American and British coffee shops all over the world. 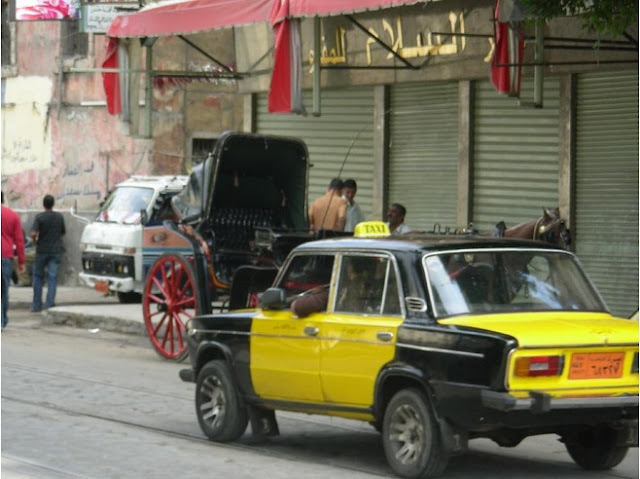 If you are in the city using the public transport, you will see black/yellow taxi all around Alexandria. This is the colour of taxi used by everyone. Each taxi should have a metre but it is a practice that it is not being used. You may ask a local person on the approximate fare from point to point and when the time comes that you need to board a taxi, make sure you agreed on the fare before you get in. I took a photo of Hantour, the traditional carriage in Egypt. I feel that this is the best and most enjoyable way to tour the city. I suppose the carriage can be hired with a driver which can be found on the main street. 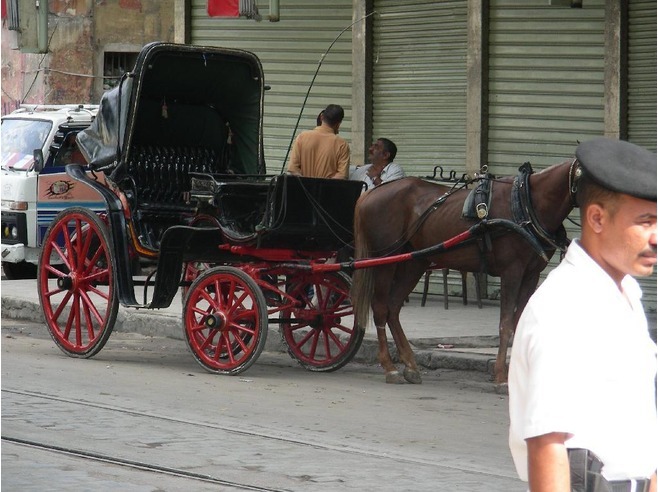 There is heavy traffic in many streets in Alexandria especially on narrow roads. I have seen it, though I cannot take photo with good angle to show you the traffic. I am giving this warning especially if you are a tourist and you are on your way to the airport or railway station trying to catch your flight or your train schedule. Make sure you give time allowance for the traffic, just in case. 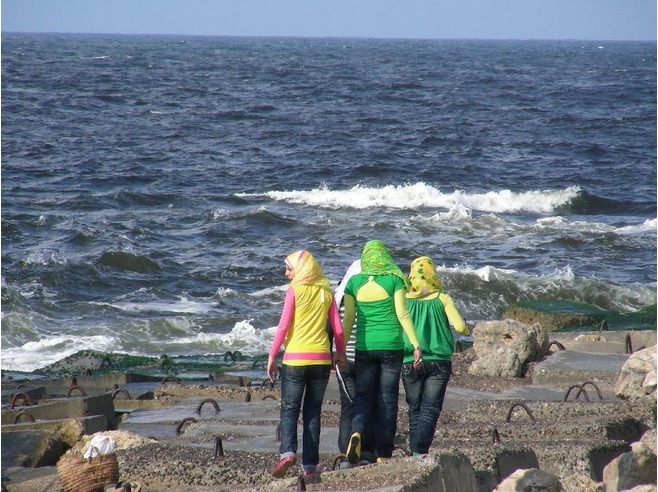 Now if you are ready to fly to Egypt, think about Alexandria. And if I am able to convince you to visit the city, you will be glad you read my tips and blogs. At least you will have an idea what to expect. A blogger and a Canada-based freelance writer. He shares the value of his travel experiences and discoveries with his friends and fellow travellers. Share your passion, join and visit him. Send him a message @ fromatravellersdesk(at)gmail(dot)com.